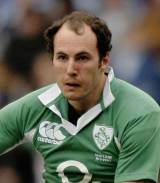 Ireland fullback Girvan Denpsey has become one of the most secure and reliable players in the Ireland setup since his debut against Georgia in 1998. Dempsey began his career with Terenure College, winning a Leinster Schools Cup, before making his provincial bow for Leinster in1996. International recognition followed in 1998, with Dempsey making his first impact on the wing. He has since gone on to secure 82 caps for Ireland. Dempsey has spent much of his international career vying with Geordan Murphy of Leicester Tigers for the Ireland fullback berth. Dempsey was selected for Ireland world Cup squads in both 2003 and 2007, starting all of Ireland's matches in Australia in 2003, but was overlooked for Ireland's crucial group game against Argentina in 2007. Dempsey was part of the Ireland teams that won Triple Crowns in 2004, 2006 and 2007 alongside fellow Leinster team-mates Brian O'Driscoll and Gordon D'Arcy. Dempsey was also part of the Leinster side that won the 2007-08 Celtic league at a canter. Dempsey started at fullback against New Zealand at Croke Park in November 2008, but lost his place to Murphy for the crunch Test against Argentina the following week.